What are people saying about All Levels Track Days? 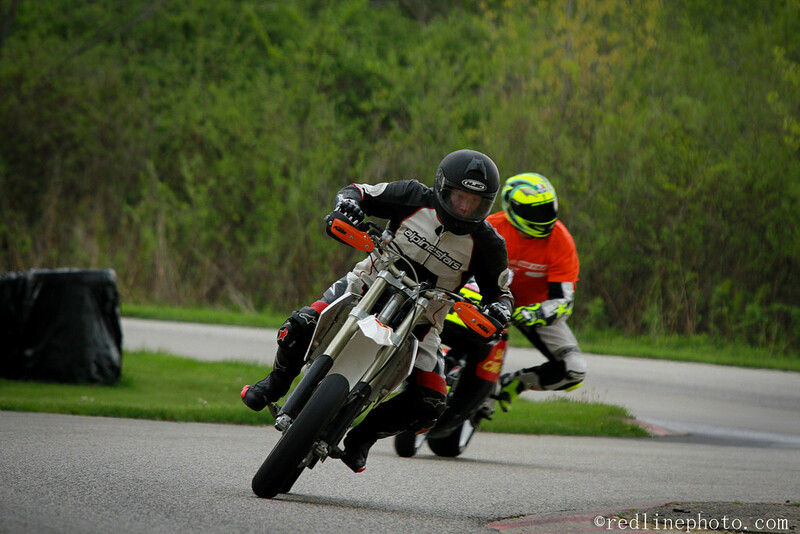 I had attended one of your track days at Blackhawk Farms this past weekend. I would like to compliment your staff on being very professional and safe from start to finish on the day I had attended. The controls riders were awesome in every way , from the morning and afternoon riders meeting to some red flag incidents on the track. Even to the point of the one of the control riders coming to our pit to talk to us one on one about advancing group color. 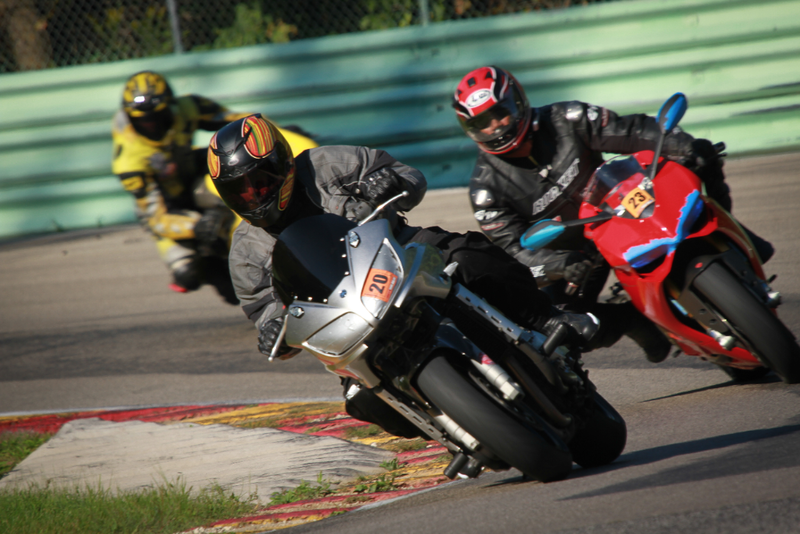 I am a 46 year old GM of a motorcycle dealership in the Green Bay area who came down with 3 of my employees ( 1 of which does your track days on a regular basis and talked us all into signing up) . I myself now plan on doing every one of your track days I have the chance to do next summer and plan on bringing some new faces from our area as well. Thanks again for making my track day a great and fun experience , my last track day at Blackhawk was over 20 years ago and you have me hooked all over again. P.S. I have just signed vacation requests for 2 of my employees to attend the Sept. 30th event, I wish I could make that one but I have a prior commitment. Keep up the great work ! 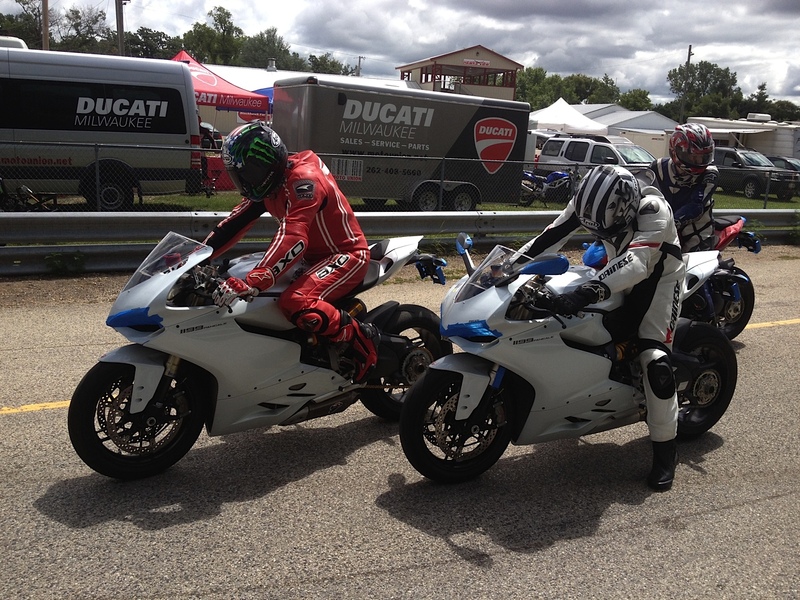 I took part in August 31st track day this year, the Ducati trackday, and had a wonderful time.. I cannot wait to do more track days next year. I am the most novice of beginners, having taken the MSF basic course and bought my first motorcycle in November, then putting it up for the winter, which comes early in Wisconsin and leaves only reluctantly! I only got to put a few miles on the bike back then (seriously, like 4!). But all winter I dreamed and read. 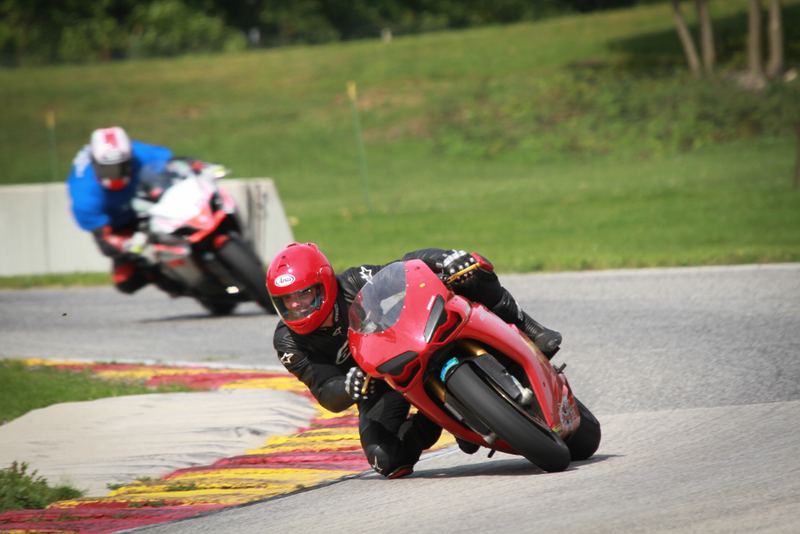 Come spring, I’d decided that one of my goals, one of my bucket list items, was going to be to ride my new (to me) motorcycle on a real race course. Maybe not race, but at least get to ride a real track. I live a bit over an hour from Blackhawk Farms Raceway (http://www.blackhawkfarms.com) an idyllic, nearly 2 mile circuit less than an hour and a half from both Milwaukee and Chicago. Checking it out, I discovered that the track partners with Motovid (Motovid.com) to offer All Levels Motorcycle Track Days throughout the summer. 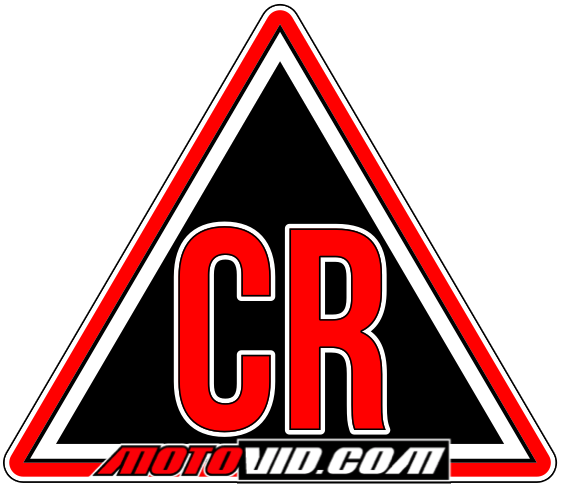 The events are exactly what the title implies, geared to all levels, although I didn’t then appreciate how seriously committed the folks at Motovid are to making everyone welcome and able to enjoyably participate. Firstly, if you’re not a novice, Motovid’s Track Days are absolutely excellent, with superb guidance, some real training and a great opportunity to (safely) wind it up and let it go. Intermediate and advanced groups are exactly that, and the highly experienced Motovid folks simply provide the context and (again, safe) structure, without getting in the way of the fun. If you are a novice, it’s even better! It begins with the most warm, welcoming, spirit of camaraderie of any organizational staff that I have ever experienced, bar none. (And I’m an older guy, I’ve been around a lot of groups). The team that Mike Casey, Bill (?) [damn, who was that big guy, did a good job with orientation? Hate that I can’t bring up his name!] and ______ [insert impt owners/managers] have put together over the last eight years of offering All Levels Motorcycle Track Days is not only outstanding in terms of expertise, but totally willing at every moment to offer help, guidance, useful non-judgmental critiques aimed at improving rider skills, and accommodate everyone’s skill levels. Frankly, I was struck, in a good, strong way, at how available all of the staff were to make the riding experience fun, safe and a hugely worthwhile learning experience. The whole day long I never asked a question from anyone, even asking where fuel or the bathroom was, that didn’t elicit staff stopping, answering my questions fully, and making sure that, whatever I had asked, I was satisfied that I had gotten a complete, useful answer. Because I’m such a novice, most of my observations were focused on what it would be like to attend Track Days as a novice, although I don’t think I saw even one intermediate or advanced rider that day without a smile on his face! But back to being a Novice. This would be subject to change of course, but the Motovid All Levels Motorcycle Track Days is an entire day of riding and learning. Riders get to ride on the track in groups of roughly similar skills so that novices ride with other novices while they are learning and building skills necessary to eventually ride faster and more skillfully. The day starts with tech inspections of riders’ motorcycles. 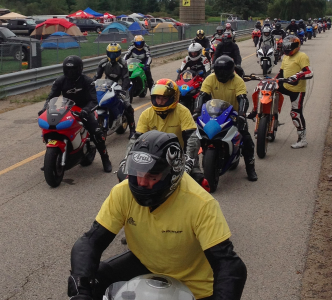 Riders are not racing; they are enjoying the track with other riders in a supervised, but pretty free context so the tech standards are focused on safety, not on how powerful your motorcycle is. A bike in good, safe condition, good tires, glass taped for safety, DOT/SNELL helmet, leathers (generously and reasonably available for rent, wow, easy! ), boots and gloves complete the basic requirements. A “standard” motorcycle street bike is as welcome as an Italian or British “crotch rocket.” Indeed, I noticed among some of the more experienced track riders I talked to that there was even a bit of a cachet regarding who had taken the most unexpected motorcycles out onto the track for a day! After first thing in the morning tech inspection, a general riders’ meeting is held including all of the riders, in all groups, where the “rules of the track” are laid out, including safety flags briefing and means of communicating with riders is spelled out (such as if there should be an equipment malfunction and how to safely enter and leave the track). Thereafter, the three rider classes split up for more focused orientation. Each group gets time on the track, about a 1/4 hour every hour, throughout the day for about 6-8 separate opportunities to take to the track in a day, and plenty of time to rest, absorb experiences and lessons, and plan what to focus on in the next round. For novices, the track time is interleaved with classroom time focused on how things went, how they could go better, and recommendations of things to focus on when back on the track. Learning is work, and the breaks are welcome respites as well as good opportunities to reflect and let things sink in. When I was there, the Novice group gathered in a classroom and was briefed specifically by Head Control Rider Harry ____, a decades-experienced rider who also happens to be a university professor in his spare time. Harry provided an informative and totally unintimidating introduction to the basics of track riding, how the Motovid.com program works for novice riders and introduced his assistant Control Riders. Let me interject that the “student-teacher” ratio was astonishing; probably no more than six novice riders for each control rider, and Harry on the track besides. Initially, Control Riders act as the “head dog-sled dogs” for each of the 3-5 novice rider clusters heading out on the track. Novices follow their Control Rider who sets the pace, demonstrates a good line through each of the track’s 7 unique turns and provides a good example of rider technique. After following the Control Rider several times around the track (decreasing as the day progresses) the CR waves “his” (or “her”, women are well represented on the track!) Novices by and the riders are on their own to explore the track and hone their skills. CRs continue riding along, only now they observe the riders and offer guidance both during the ride and off-track between riding sessions. There is no doubt that everyone participating leaves a better rider at the end of the day than when he and she first got there. Being as inexperienced as I am, I confess to having arrived plenty intimidated by the prospect of looking foolish in front of other “real” riders. I could not have gotten it more wrong. It seems as though all of the staff actually remember what it was like when they too were new. And as best I could tell, so did every other experienced rider I met that day. Only safety violations would draw any kind of disapproval, and even that seemed to be tempered if the rider had simply made a mistake of inexperience. Motovid even caters lunch, an excellent chance to start meeting fellow riders and get to know staff a bit more. All in all, even given my limited abilities and experience, I could easily have arrived, registered and been track riding all day if I had just done it! But for me, there was a very valuable silver lining: I managed to meet more warm, caring, fun, sociable, great men and women in one day than I have probably met in any other single day of my life. You know that I can’t wait to get back there. ← HUPY AND ABRAHAM, S.C.